Super Smash Bros. has traditionally cast a wide net across a divided audience who demand contradictory things from the blockbuster platform fighter. For its party-game fan contingent, Smash rains down Bob-ombs and Party Balls. For its fiercely competitive fan contingent, it flattens stages and removes platforms. In the past, Smash has catered to its split fanbase by making a middle-of-the-road fighting game that tries to appeal to everyone. The next game, Super Smash Bros. 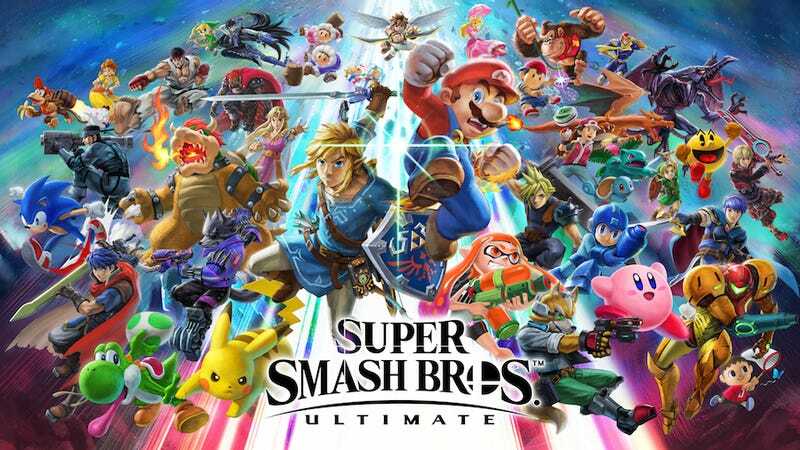 Ultimate, seems to actually cater to everybody at each end of the spectrum for what seems like a massively crowd-pleasing iteration of the world’s most crowd-pleasing fighting game. Out December 7, 2018, Smash Ultimate reaches for single JoyCon players and, with Nintendo’s upcoming release of new GameCube controllers, competitive Smash purists. It’s fast, like pros’ beloved Melee, but also includes the trappings of Smash nostalgia with the return of the Saffron City stage, with refreshed graphics for 2018. After twenty minutes of hands-on with Smash Ultimate’s limited E3 demo, it’s clear that this game is reaching to pull in each extreme of the franchise’s fan base. Its huge, all-inclusive roster is the most obvious signal. Every single Smash character from every damn Smash game will be in Smash Ultimate. Missed Metal Gear’s Snake or the Ice Climbers? They’re there. Hate Bayonetta? Well, bummer, because she’s there, too. There will be three different versions of Link. Smash Ultimate will, of course, capitalize on the success of Switch releases like Zelda: Breath of the Wild and Super Mario Odyssey with a redesigned Link and Mario. And, after nearly 17 years of hoping, Smash fans will finally see Ridley, Metroid’s dragonesque antagonist, as well as Splatoon 2’s charismatic Inklings. These two new characters are intuitive to pick up, but have deceptively deep movesets. One of Ridley’s moves, his down-B, stuns and does major damage to enemies if he’s spaced just right. His recovery move is a lot like Fox’s, a mainstay in the Smash series. Although he’s large and strange, Ridley doesn’t feel unwieldy like Smash 4’s more burly fighters. Similarly, I was surprised by how true-to-form Splatoon 2’s squid kids feel. Splatoon 2 is the sort of game that’s easy to grok, but difficult to master, and Smash Ultimate’s Inklings feel that way, too. It’s easy to land big damage rolling over an opponent with the splat roller, but harder to remember to ink them first for added pain. Likewise, it’s easy to splatter enemies with ink, but harder to pace refueling. Overall, both new additions feel like true Smash fighters, not Frankensteined add-ons. Will there be more Smash characters in Smash Ultimate? “We made including every single fighter ever our number one goal,” said Smash creator Masahiro Sakurai in Nintendo’s press conference. “So we’re kind of hoping you aren’t expecting too many new challengers.” What Nintendo did say is that Smash Ultimate will “streamline” the character-unlocking process, but we didn’t get more details on that, either. Nintendo similarly did not reveal details about single-player or party modes for Smash Ultimate, which might let down Smash’s more whimsical fans. It will be interesting to see what this version learned from Brawl’s wacky single-player adventure and Smash Wii U’s ridiculous board game, Smash Tour. Several quality-of-life updates will make more confusing aspects Smash more comprehensible to new players, too. A small box will appear when a fighter is off-screen but not eliminated, indicating where that fighter is in relation to their opponents and the stage. Also, more fighters with abilities that rely on cooldowns or limited resources will have meters near their damage percentages. Now, when Robin is running low on magic resources, you’ll know just how low. Same with Cloud’s limit gauge. Smash Ultimate will refer to fighters like Lucina and, now, Daisy as “echo fighters,” whose movesets are reskins of previous fighters’. Smash Ultimate’s got some goodies for more particular players. Players choose what map they play on before they choose their fighters. That’s big for players who want to optimize their fighter choices for the map they’ll play on. Smash Ultimate gives players a lot of control over their map experience, too, offering all maps’ full versions, Battlefield versions and Final Destination versions. Smash 4’s “Omega” mode for stages simply flattened them and removed platforms and distractions; Smash Ultimate gives players more options for no-hullabaloo competitive stages. That rules. Some other good tweaks: Samus can charge her arm cannon mid-air; Link’s bombs will remotely detonate, a la Zelda: Breath of the Wild; Shulk can switch fighting modes a little more easily; Mii Fighter fans can choose from 12 voice options for their character; there’s a girl Pokemon Trainer and a girl Pikachu, complete with a heart-shaped tail. Players who love Smash’s items have a lot to look forward to. Thankfully, Smash Ultimate promises to make final Smash attacks “straight to the point,” according to Smash director Masahiro Sakurai. Fans who complain that these huge, cinematic abilities disrupt the flow of fights might finally start embracing Smash balls. Nintendo paraded lots of updated Smash attacks during its direct, too, like Link’s, which uses his Ancient bow and arrow, and a bigger, scarier final-Smash Bowser. Also, players will get points for defeating any of over 50 characters who might show up as an assist trophy in Smash Ultimate. Now for the million-dollar question: Does Smash Ultimate feel like a new game? When I commented to Bill Trinen that Smash Ultimate looks a lot like Smash 4, he responded, “If you look closely, it’s not. They’ve done a bit of a toon shading to it. There’s quite a bit of effects work they’ve done that’s different from the previous game. They’ve completely redone the game for Switch.” That said, I’m not sure core Smash fans will find Smash Ultimate significantly different from Smash 4. To me, that’s a good thing. I think Smash 4 is the best version of Smash we’ve seen yet. Sped up, and with some quality-of-life changes and players’ favorite fighters and stages from yore, Smash 4 would have been truly great. Smash Ultimate doesn’t seem to be taking huge risks, and I’m pretty sure that’s going to make it a big hit with Smash’s divided, but passionate fanbase.